About 61 political parties have said that some terms inserted into the 2019 election guidelines by the Independent National Electoral Commission (INEC) are unacceptable to them. The parties, according to the National Chairman of the Action Peoples Party (APP) and the Publicity Secretary of the Inter-Party Advisory Council (IPAC), Chief Ikenga Ugochinyere, believe that the new clauses would ruin the 2019 polls. Chief Ugochinyere, in a statement Friday, said the political parties rejected the clause in the guideline which “allows unduly accredited voters” who have PVCs to vote even if their names were not on the voters' register. 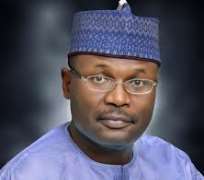 He said that the parties would pass a vote of no confidence on INEC Chairman, Prof. Mahmood Yakubu, if he goes ahead to release the “contentious guidelines” on Monday, without further consultation with political parties. The statement says, “Political parties demand retention of 2011 and 2015 separate accreditation time and separate voting time to help forestall rigging with the presence of voters at the polling unit instead of INEC 2019 simultaneous accreditation and voting. “Political parties demand announcement of accreditation figures by 12 noon on election day and recorded in a signed form and given to party agents before voting starts, to forestall doctoring of election figures during collation. “Political parties demand stoppage of PVC collection 10 days to the election day and disclosure of the total number of PVC collected on polling unit basis to political parties. “Political parties demand transparency in collation and transmission of results with accredited representatives of election observers and political parties monitoring. “Political parties reject the creation or usage of secret polling units called voting point settlement and demand full list and location of such units.